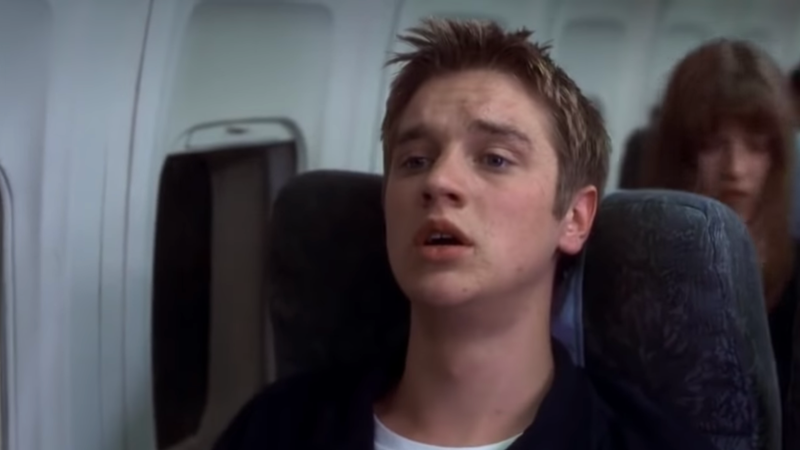 Sunday marked the 19th anniversary of the release of Final Destination, the first installment in a horror franchise of diminishing returns that pitted a group of unsuspecting teens against the Rube Goldbergian schemes of Death itself. On Sunday, star Devon Sawa, mistaking the date for the film’s 20th anniversary—it happens, buddy—tweeted out a message simultaneously commemorating the anniversary and forecasting his own doom. For anyone who doesn’t remember, the inciting incident of the first film involves a pretty horrifying plane explosion that’s predicted by Sawa’s character, causing him and a handful of classmates to flee the plane, cheat fate, and piss off Death. Fans got a morbid thrill out of Sawa’s tweet and immediately began taunting him with GIFs of Tony Todd’s coroner character, Bludworth, and other mysterious coincidences involving the number 317. It appears Sawa’s flight landed safely, however, as the actor was soon flaunting his continued existence in Death’s face. As an added bonus, though, we got a glimpse into an alternate universe when Seth Rogen popped into Sawa’s replies to say he originally auditioned for the role played by Sean William Scott. While we never got a chance to see what Rogen would have done with that very on-brand stoner character, Sawa correctly notes that there may be a spot open for him in the forthcoming reboot. We’re just hoping there’s one for Sawa.